COLUMBUS, Ohio, March 19, 2019 (GLOBE NEWSWIRE) -- ARCOS® LLC has implemented its automated callout system for NorthWestern Energy, a provider of electricity and gas to 709,000 residential and business customers in Montana, South Dakota and Nebraska. The utility runs ARCOS around the clock to call out first responders across its electric and gas operations to respond to system and customer needs. NorthWestern Energy also uses the ARCOS solution to determine which additional resources the utility should activate for restoration work. 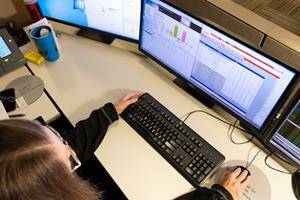 A distribution dispatch coordinator launches a callout with ARCOS, while scanning her outage management system. 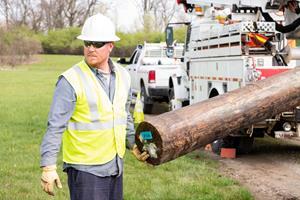 A lineman guides a new pole, suspended by a crane, into position for installation. Until implementing ARCOS, the utility relied on a manual process for calling out resources after hours. NorthWestern says the manual tracking done to tally the percentage of callouts accepted by an employee was prone to errors. The errors made it difficult to determine which employees weren’t accepting a reasonable amount of call outs. ARCOS now helps with reporting and tracking and provides supervisors with an opportunity to understand who accepts callouts on a regular basis. According to NorthWestern Energy’s managers, the process has truly become the responsibility of the employee, which makes individuals more accountable. NorthWestern Energy’s supervisors also say the ARCOS solution gives workers the flexibility to make themselves available or unavailable for callouts during time periods that align with what’s happening for them professionally or personally. For example, if workers are in training or sick, they can take their name off the callout list. When employees have a commitment outside of work, they can set a callout schedule (covering a period of up to 72 hours) that accommodates time off. With ARCOS automating callouts, the utility’s after-hours dispatchers in Montana have noticed that the time it takes to reach the utility’s first-responders has gone from several minutes to seconds. Since callouts are no longer handled manually, the dispatchers now have more time for analyzing and responding to situations affecting the system and their customers. With NorthWestern’s workers’ shifts contained in ARCOS, managers can better plan daily shifts, easily report on who is and isn’t working and efficiently respond to interruptions in service.